It is my annual doorstop time, aka Vogue September Issue. I have already scheduled my post-reading massage to work on all those muscle injuries I will endure while lugging around. I found the best place to read it is on the kitchen table so I don’t have to hold it in my lap (my legs went numb the last time). Of course lattes make the perfect reading companion. 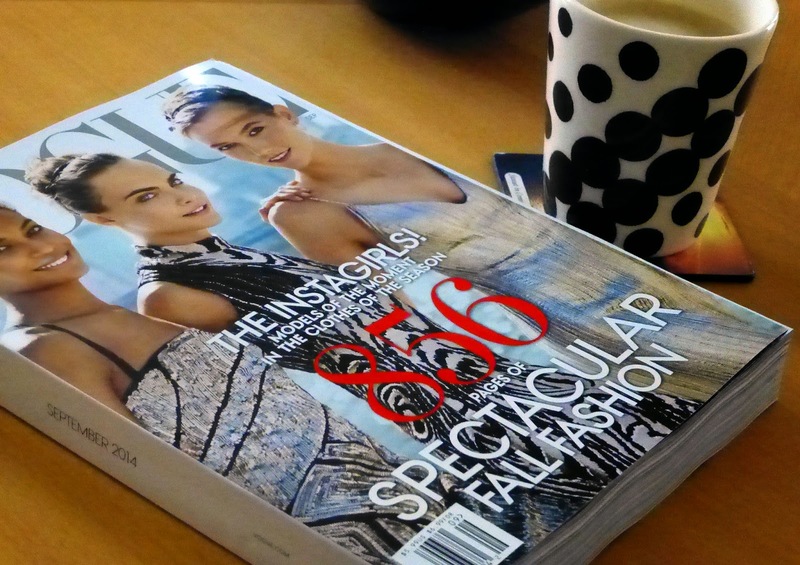 The 2014 September Issue of Vogue has 856 pages, thin compared to the last year’s 902. Don’t be surprised of a sudden desire to ride a horse through fields of wild flowers, dance passionate tango, cover yourself in fur, or run to Paris to eat steak with pomme frites after reading the issue. If you do go to Paris, don't forget to pick up a silk cravat so you can wear it just like the magazine suggested. We left for the airport at one in the morning. It was a white minivan, I think it belonged to a family friend. Or a friend of a friend. A small group of family and friends lingered till the end to help us load up the minivan and say their tearful goodbyes. I sat by the window, wide awake and scared. It was going to be a long ride, Moscow’s Sheremetyevo International Airport was well outside the city limits. The road lead through a forest. There were rumors of highway robbers in that forest: they knew that most of the cars on the road in the middle of the night were people emigrating. Flight was at 7 a.m. Check in was at three. We got lucky, no robbers for us.